(Frick, 23 March 2017) Today, Dr. Weicai Yang, Director of the Institute of Genetics and Developmental Biology (IGDB) of Chinese Academy of Sciences (CAS), signed a five-year bilateral cooperation agreement with Dr. Urs Niggli, Director of the Research Institute of Organic Agriculture (FiBL) Switzerland. 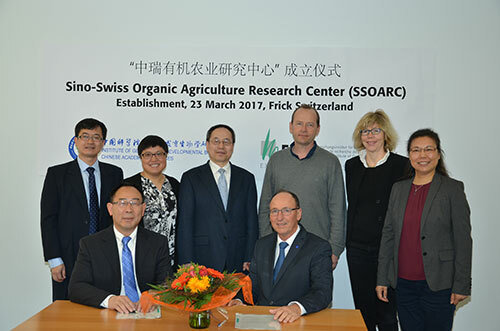 A new mutual research center - Sino-Swiss Organic Agriculture Research Center (SSOARC) was established between FiBL and IGDB during the signature ceremony. The newly established SSOARC will be co-located at Changzhou Genetic Resources Research and Development Center (South), CAS, ChangZhou City of Jinagsu Province of China and at the Research Institute of Organic Agriculture (FiBL), Frick, Switzerland. Based on this mutual research center, FiBL and IGDB will promote basic research for friendly and sustainable agricultrue, the transfer of know-how and practical knowledge to Chinese companies and farmers. SSOARC will also offer academic workshops to address key technical problems where current practice falls short of organic principles and jointly set up research programs on organic agriculture, for instance organic seed breeding, plant and microbiota interactions, soil fertilizer and compost for organic farming, and health improvement of animals and plants, etc. Mr. Kuai Zhang, I. Secret of Department of Science and Technology, P. R. China Embassy in Bern, attended the signature ceremony and gave a warm speech. The importance of organic agriculture has become increasingly prominent worldwide. The No. 1 Central Document of the CCCP and State Council issued in February 2017, promotes the transition of current agriculture from over-reliance on resource consumption to green, ecologically sustainable agriculture. It supports the establishment of a number of modern agricultural science and technology innovation centers and innovation alliances. Based on this background, FiBL and IGDB will work together to set up cooperating programs within the next 5 years to promote research in sustainable agriculture. The Research Institute of Organic Agriculture (FiBL) is an independent, non-profit, research institute with the aim of advancing cutting-edge science in the field of organic agriculture. FiBL was founded in 1973 and is situated in Frick since 1997. It is one of the world’s leading research and information centers for organic agriculture and employs over 175 experts. FiBL’s research team works together with farmers to develop innovative and cost-effective solutions to boost agricultural productivity while never losing sight of environmental, health and socio-economic impacts. Alongside practical research, FiBL gives high priority to transferring knowledge into agricultural practice through advisory work, training and conferences. FiBL has offices in Switzerland, Germany and Austria and numerous projects and initiatives in Europe, Asia, Latin America and Africa.